Numerous lines of evidence indicate that insulin and its receptor regulate cell proliferation, survival and transformation, and thus, tumorigenesis . Indeed, the fact that insulin has a potent tumor-promoting activity has been known for a long time. In wild-type animals, administration of exogenous insulin markedly enhances development of experimental breast and colon tumors [34, 68, 117]. 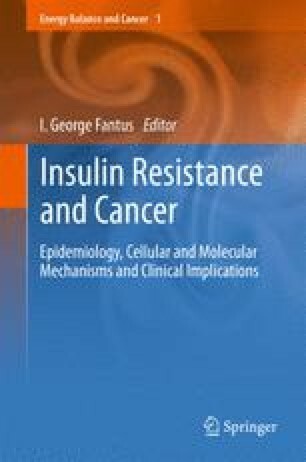 In contrast, insulinopenia in animals with chemically-induced type 1 diabetes (T1D) results in a significantly reduced tumor growth, which is restored after insulin administration [29, 67, 112, 113]. Moreover, intraportal implantation of pancreatic islets in rats with T1D creates an insulin-enriched microenvironment, which promotes hepatocarcinogenesis . The aforementioned studies thus link insulin and cancer mechanistically, and indicate that insulin plays the role of both a tumor initiator and promoter.